Afternoon and evening rides have a unique charm. Whereas morning rides tend to invigorate, rides late in the day have a more mellow, downtempo feel to them. I also find that packing a good set of lights for any ride that I start after about two or three in the afternoon (depending on the time of year) alleviates the anxiety of getting home before dark and instead allows me to enjoy the transition from day to night. In the late afternoon and evening, the sun dapples the landscape with flickering rays which are woven between long shadows, refractions and highlights not seen earlier in the day. The sounds of the various creatures around me change and air gets gradually and ever more pleasantly cooler. 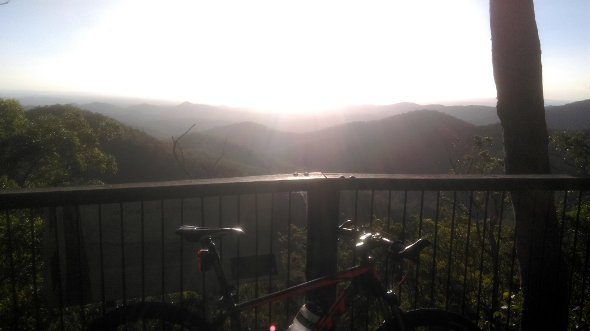 Such was my recent afternoon trundle through the Samford Pony Trails and up Mt Nebo along the Goat Track. 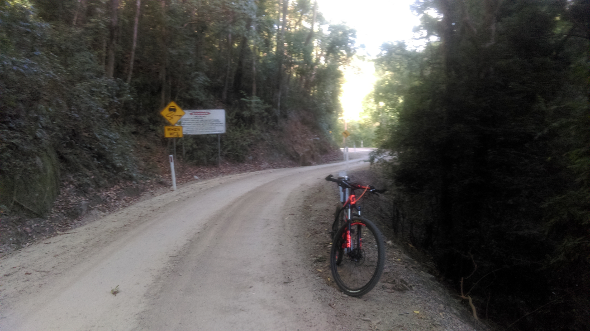 Cutting through the fire trails at Ironbark Gully and ducking through the tunnel under Samford Road, I eventually popped out on Lanita Rd and the Ferny Grove Rail Trail which is really the entrance to the Pony Trails route. The Samford Pony Trails have a whimsical, labyrinth feel to them as they transition from sealed country road to dirt road and then disappear into the bush completely behind this property or along that creek and pop out onto another road. 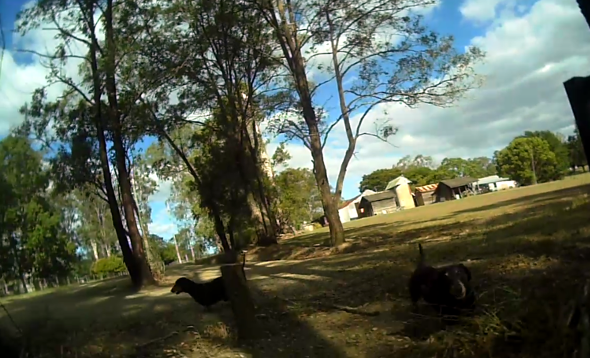 Entering a rocky little stretch of singletrack off the dirt section of Petersen Rd, a pair of sausage dogs took me by surprise and chased me as I passed the front gate of the property that someone had (accidentally?) left open. Luckily, the rocky descent at the start of the singletrack was too unnerving for them and they quickly stopped and turned back. The singletrack emptied out into a clearing and descended further into a creek crossing. 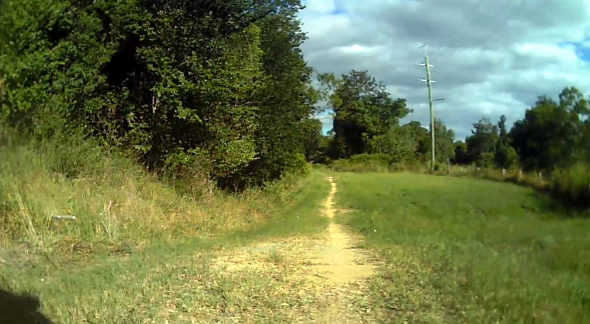 As I climbed up the opposite side of the creek bed and onto a smooth, wide track running next to a property, I remembered taking this route a few summers ago and, in this very spot, stopping in my tracks due to a massive python laying stretched out across almost the entire width of the track. We stood and stared each other down for several minutes before I realised that he wasn’t about to give up his place in the sun to let me pass. Gingerly, I tiptoed around in front of him along the grass strip close to the fence with my bike between us. 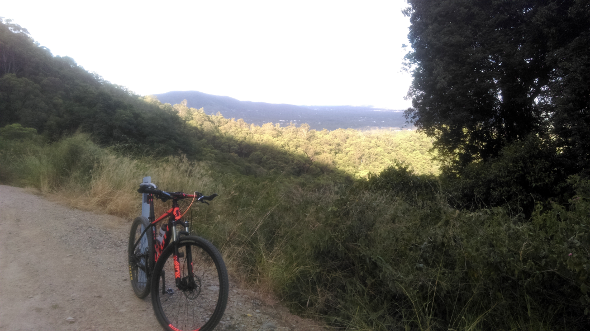 I continued through the Pony Trails until I eventually ended up on Mt Glorious Rd which I followed for a few kilometres until I reached the entrance to the Goat Track. Mt Nebo towered above me like a giant green beanbag as I started the three or so kilometre climb and maintained a steady rhythm up the side of the mountain. Green, undulating vistas opened and morphed as I climbed ever higher. The valleys and dense rainforest below looked enchanted. 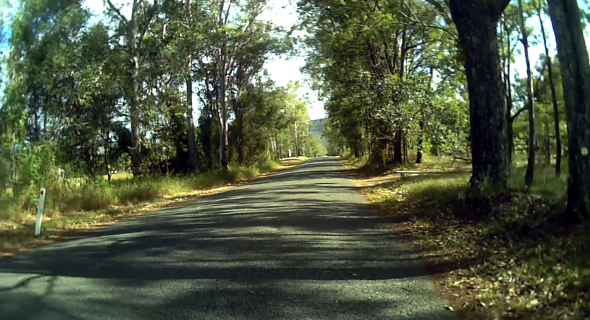 Eventually the Goat Track disappeared into the shadows of some large, ancient looking trees at the top of Mt Nebo and, after a short break, I continued right along Mt Nebo Rd towards Mt Glorious. The air was decidedly cooler up here and a thick, deep green rainforest canopy covered the road. Moss grew on any stonework or old timber that it could attach itself to and, besides the occasional unwelcome bellow of a car or motorcycle passing by, the only sound that could be heard was the Bellbirds in the forest. At the top of a nearby rise, I arrived at Manorina – a small, green nook of rainforest with a short walking track to a waterfall that runs off the eastern side of Mt Nebo after a good lot of rain. In the eighties, there used to be a camp ground there too and when I was maybe seven or eight years old my parents took me there to stay for a few nights. The air was particularly cool and I developed a fever after the first night. 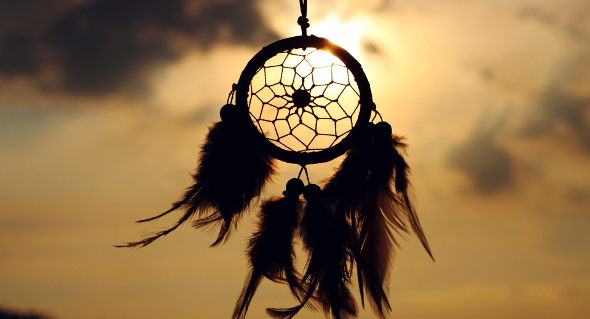 Although the fever wasn’t pleasant, I remember laying in the old canvas tent we had and, in my pyrexia, hearing the sounds of the rainforest, feeling the crispness of the air and developing an odd sense of the ethereal which is hard to put into words – like a full immersion into the surrounding forest or something. The same sense flooded me today as I passed the spot and breathed the cool Nebo air deep into my lungs. Several kilometers further, I arrived at the Westridge Outlook – a viewing platform looking west high above the D’aguilar National Park. The low, setting sun sun shone brilliantly as it hovered above the distant peaks and caused a haze to appear over the valley below. Small birds darted through the rays causing tiny flickering shadows on the platform. 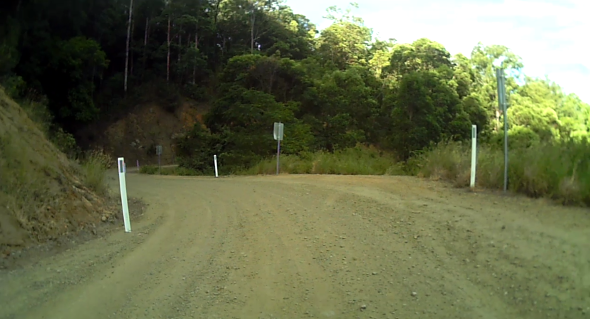 After a quick snack and a chat to some other visitors to the platform, I continued a few more kilometres to Mt Glorious where the road forked onto Mt Glorious Rd again and past the entrance to the Goat Track. The descent along this section is steep and winding with cliffs on one side and the very upper reaches of the South Pine River trickling along as little more than a bush creek on the other. As I reached the bottom, the increase in temperature and humidity was palpable and a sure sign that I was now on the home stretch. 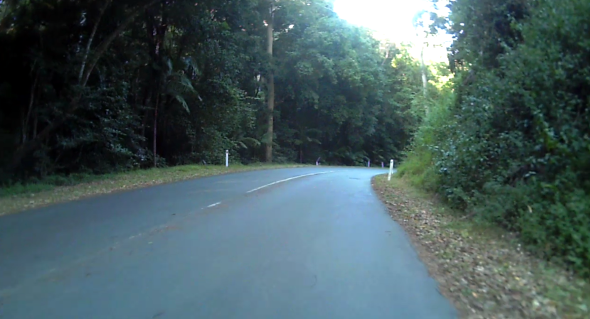 I continued along Mt Glorious Rd back to the Pony Trails and reached the required fork in the road just as evening set in and I needed to set up my lights. Darkness brought about a whole new atmosphere to the last part of the ride – a calm, theatre, pantomime quality that seemed slightly unreal. I back tracked through the Pony Trails now decorated with the lights from the rural Samford properties. A large hare dashed across the track near the spot when I had seen the python a few years earlier. Arriving home around 7:30pm, I had just enough time to eat and shower before falling asleep with the highlights of the ride replaying in my head. See out there some time. Sounds like a wonderful ride (again!). Nebo and Glorious are certainly one of Brisbane’s best biking haunts. Also a great gateway to the Brisbane Forest Park and beyond. We’re pretty lucky to have them.